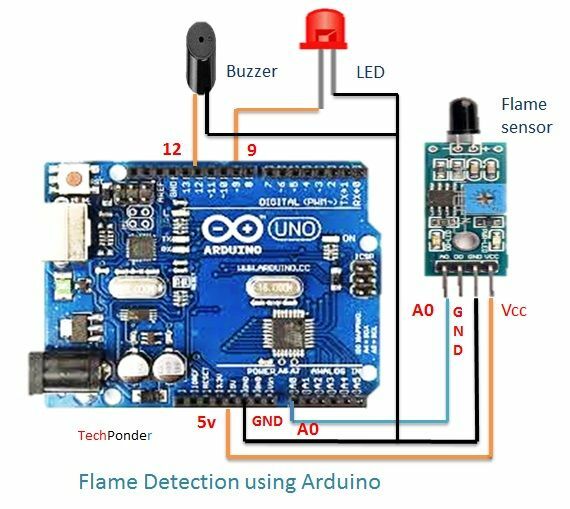 The main brain of this project is the Arduino, but in-order to sense fire we use the Fire sensor module (flame sensor) that is shown below. As you can see these sensors have an IR Receiver (Photodiode) which is used to detect the fire. How is this possible? When fire burns it emits a small amount of Infra-red light, this light will be received by the IR receiver on the sensor module. Then we use an Op-Amp to check for change in voltage across the IR Receiver, so that if a fire is detected the output pin (DO) will give 0V(LOW) and if the is no fire the output pin will be 5V(HIGH). So, we place three such sensors in three directions of the robot to sense on which direction the fire is burning. 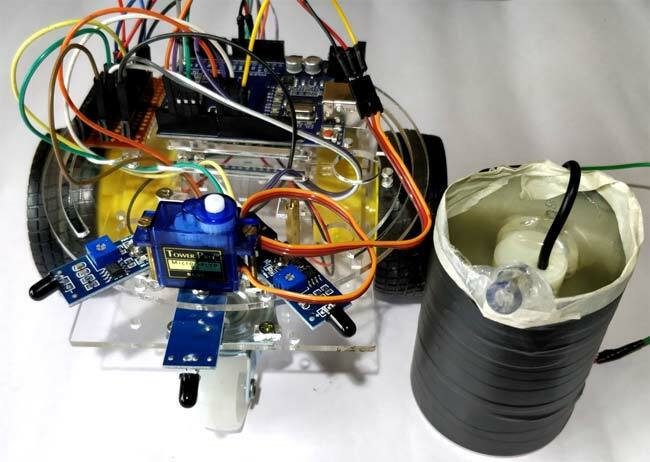 The complete working of the robot can be found at the video given below. The maximum distance to which the fire can be detected depends on the size of the fire, for a small matchstick the distance is relatively less. 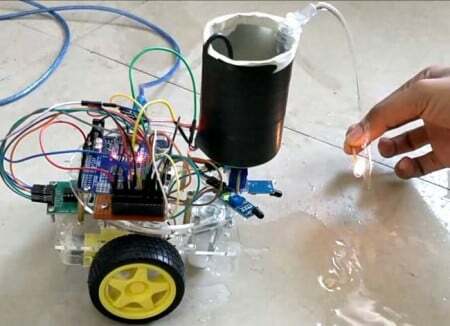 You can also use the potentiometers on top of the modules to control the sensitivity of the robot. 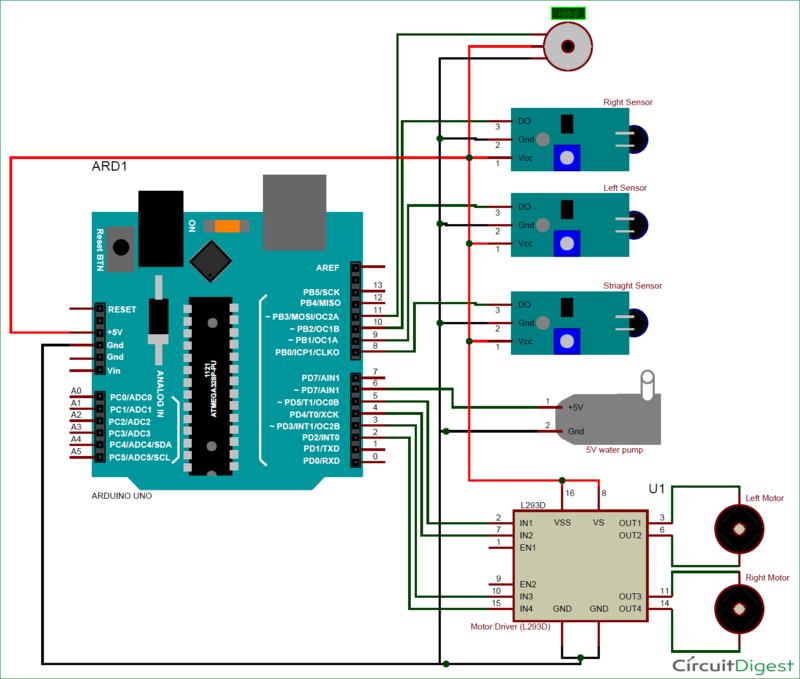 I have used a power bank to power the robot you can use a battery or even power it with a 12V battery. Hope you understood the project and would enjoy building something similar. If you have any problems in getting this build, use the comment section below to post your quires or use the forums for technical help.